Weird as it may seem, there is something important water bottles and dogs have in common. Neither should be left in a hot car. A water bottle sitting under direct sunlight (can replicate Bart Simpson melting toys with a magnifying glass. Except instead of a plastic toy soldier, you'll be igniting your car seat or the rest of the garbage you've collected on the floor over the course of the winter. Of course, since it's sunlight, the car doesn't even have to be all that hot for the effect to occur. It may seem absurd, but Dioni Amuchastegui, a battery technician with the Idaho Power Company, posted a video last summer to share a story about this happening to him. He was on a lunch break and noticed smoke coming from his car. "I looked over and noticed light was being refracted through a water bottle and starting to catch the seat on fire," he said in the video shared to the company's Facebook page. He replicated the incident with coworkers and were able to burn the seat again. The video shows the burn marks left by the refracted light and, later, the temperature under the water bottle hitting 250 degrees. Fire officials in Oklahoma have even warned drivers of the danger after investigating the video. "The sunlight will come through, when it’s filled with liquid, and act as a magnifying glass as you would with regular optics," David Richardson of the Midwest City Fire Department told Oklahoma's KFOR. "It uses the liquid and the clear material to develop a focused beam and sure enough, it can actually cause a fire, a combustion." There are more reports like this than you might expect, but the risk of an actual fire may be low. Looking into reports from New Zealand, Hoax-Slayer found many reports like this in the country, but no reports of an actual fire igniting due to a water bottle. "It's not a crisis," Richardson told CBS. "We don't know of this happening or becoming a contributing factor of car fires in our district, but the potential does exist." He said colored drinks or tinted bottles don't pose a risk. 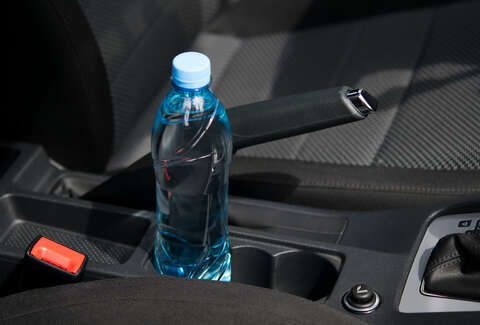 However, you should probably tuck water bottles under the seat on sunny days.